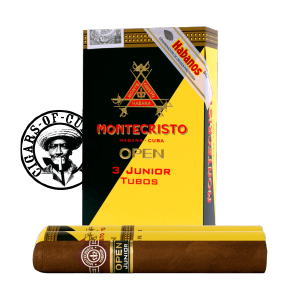 The smallest cigar from the Montecristo Open line. A small sized Montecristo with a second ring with the Golden letter Open and the vitola name. The official size is called Trabucos. Light woody and leathery aromas ooze out of this small cigar in a relaxed and controlled manner. Made for Polo and Cigar Aficionados. Junior in size maybe, in flavor this is a cigar that could just make this summer one of the best yet, especially in the Tubos format. Light woody and leathery aromas ooze out of this small cigar in a relaxed and controlled manner. Close your eyes and you feel like your in Provence.